Being so well-known, I had always imagined it would be busy, on whichever day of whichever time of year you might choose to visit. 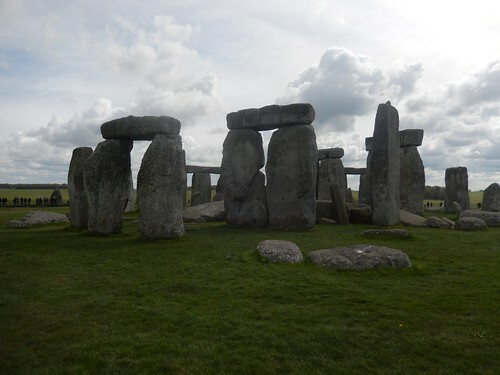 Only a reasonable journey from home, I’d always taken it for granted at the same time; assuming I could go at ‘any time’… It was when a friend shared that she’d not been to see the stones either that we made plans for this arrangement. It is advisable to book your tickets online. You’re then given a time slot in which to arrive so that you can pay for and collect your tickets before exploring the museum and beyond. We booked ourselves in for the 9.30am slot (the earliest available) and, after one-hour and fifteen-minutes of driving, arrived in good time, thanks to the SatNav. Car parking, I’m pleased to say, is free. 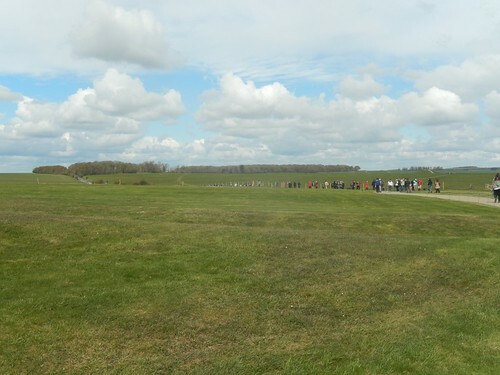 There’s also room for coaches, as you would expect but, we were both surprised that the car park wasn’t bigger – as we later came to leave before lunch, it was close to capacity and it look as though stewards were directing cars to an overflow space on the grass. On the Saturday of a Bank Holiday weekend, there was a significant queue, as you might expect. A second line provides access for people looking to purchase tickets on the day (those who haven’t pre-booked) but that seems like it could be a risky option – certainly, later in the day. If you’re a member of English Heritage or the National Trust (as I am) then you’re allowed free access to the site. Otherwise, an adult ticket is around £15 – which is, to be fair, about average for ‘full property’ access to most National Trust sites. 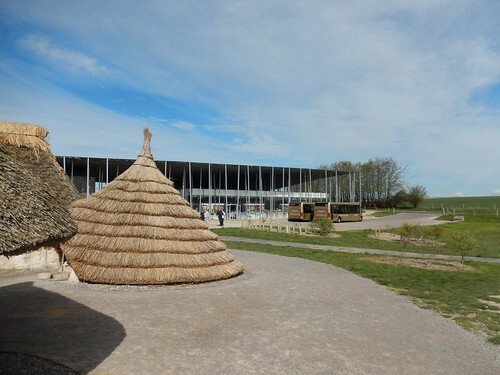 With a café and restaurant to our left and museum to our right, we initially bypassed them both to explore the outdoor attractions, where you’ll find a series of huts, built in the style of what the builders of Stonehenge would’ve lived in. 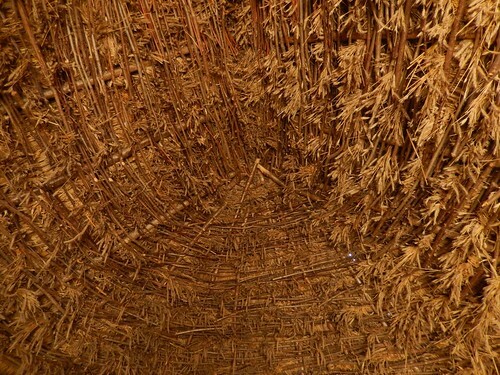 After ducking down to stoop inside a couple of these huts, we found the thatched roofs to be good insulators while the interior felt surprisingly spacious. From the outside, each structure looked tiny. But they’re not short on headroom. 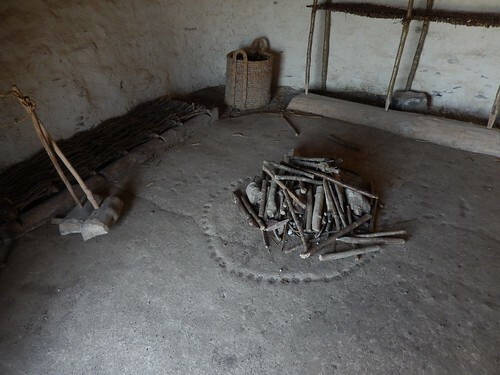 Beside the huts was a replica of one of the standing stones, in a setup based around one idea on how these stones were originally moved from their homes in South Wales – many, many miles away! Neither of us took part in this! Those stones we had drive so far to see remained out of our vision. 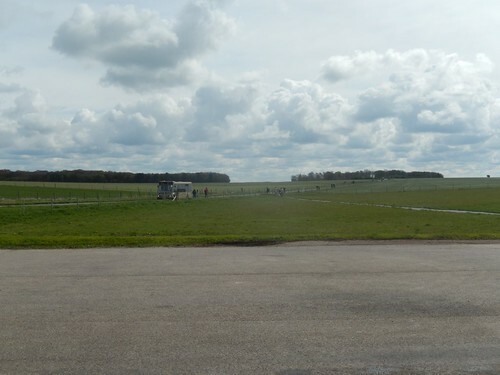 We’d both expected the formation to be visible from miles away and we were both surprised that we hadn’t spotted it on the drive over, especially as we passed Salisbury Plain. We then spend probably a good hour within the museum itself, while it was still relatively ‘less busy‘ in the early-mid morning. 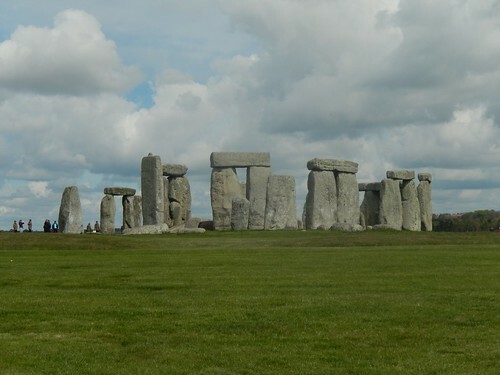 As you would expect, there’s a lot to read up on the history of the stones, their previous formations, locations along with things that scientist had learned through years of studying the site. 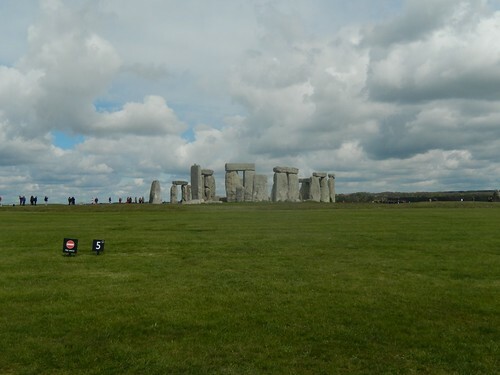 Of course, no-one knows precisely why or how Stonehenge was constructed and that’s a fact that the museum doesn’t try to avoid. One of my favourite features was an oval-shaped corridor with video-walls on either side. 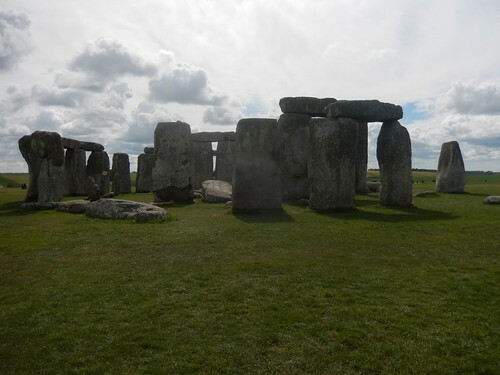 It was setup as if you were standing within the stone circle and, as the video plays, you can witness the history of Stonehenge, from its inception to the present day, all through the seasons; night and day. It must’ve been 10.30 to 11.00 by the time we hopped on the free shuttle bus and made our way towards the main attraction, via a two-minute journey. As you would expect, it was busy. 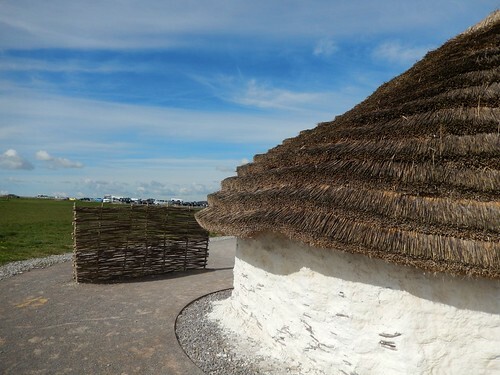 In case you haven’t previously read up on the site; there’s a fence that prevents visitors from treading within so many metres of the ancient structure. This is understandable, with fears of erosion and the sheer popularity. Although, I understand this law may be relaxed during times of the Solstice, in both summer and winter. You’d probably have to fight through hoardes of people and pagans to get close to them, though. Firstly, the A303. It really is staggering just how close that road is to the stones. I’ve heard of and read about various proposals for an alternate road – even one that cuts through the hillside – to overcome this and the continuous threat of pollution. Whatever solution is reached, I do hope it is for the best of all concerned, especially our heritage site. 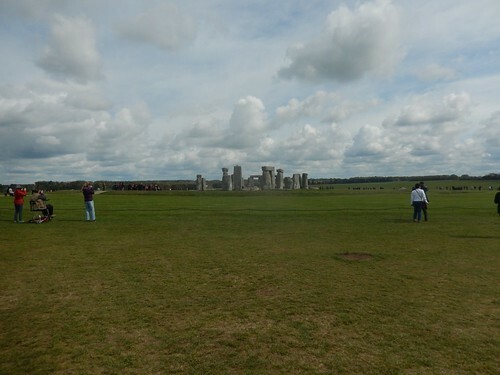 How do you perceive the size and scales of Stonehenge from my photos? We both agreed that it was a lot smaller than we had anticipated. In every photo or video we’d seen, these stones look huge. Perhaps it was a matter of perspective, as we looked one from the perimeter fence. These stones, although not small in any sense, seemed to be so very close together. I don’t wish to take anything away from it because if you’ve wanted to go, as I had and the opportunity arrives, I would always encourage you to take it. Otherwise, you’ll never know for yourself. I do like how the boundary fence is neither threatening or intrusive. 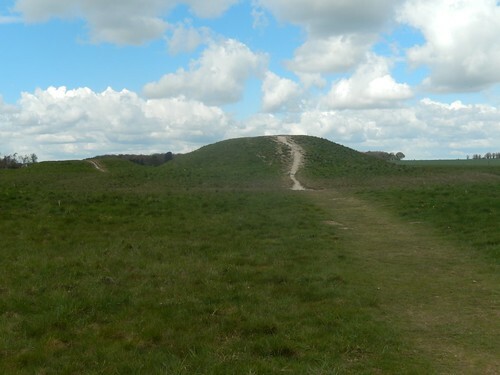 It’s unnoticeable from a distance where, as some of my photos may show; it does look as though people are closely surrounding the henge. I could not say that I felt anything ‘magical’ and there were no ‘energies’ that I was physically aware of. But that didn’t stop want small group from sitting down to meditate, perhaps chant as well. 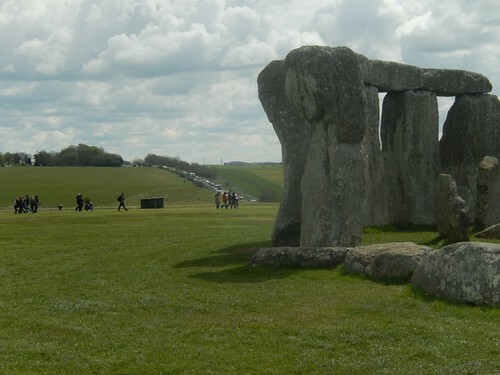 Interestingly, they positioned themselves between the stones and the A303. After taking more than enough photos, we moved on to explore more of the local landscape. I’ll include a link to my full set of photos at the end of this post. Avoiding the coaches this time, we walked on towards the barrows (tumuli) just north of the main attraction. It was quiet, tranquil and scenic with only a handful of others nearby. 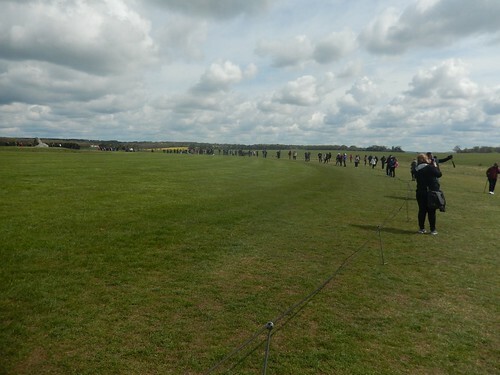 You can just make out Stonehenge, right of centre in the photo above… Yep, it really did seem small. 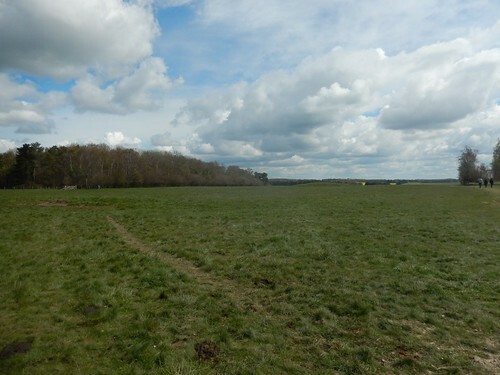 On our scenic route back towards the car park, we did also pass the site of an ancient (very) long barrow known as The Cursus; barely distinguishable today, other than for the faint outline of the original ditches. 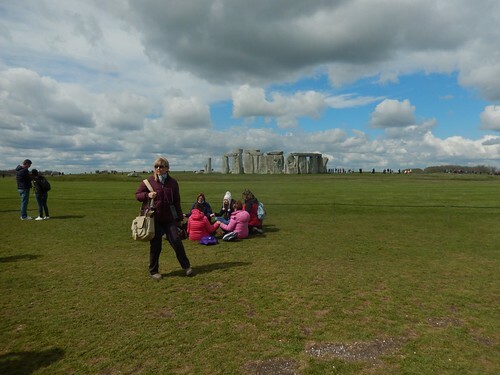 Can you visit Stonehenge without paying? 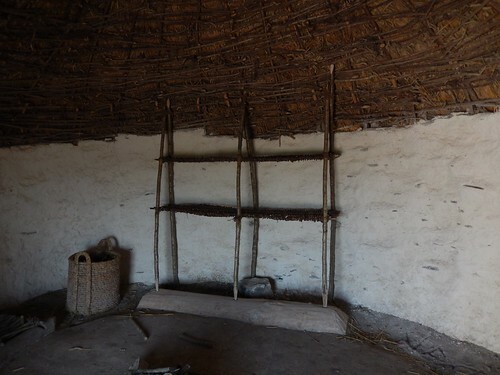 If you’ve not been before, I would encourage you to pay for your first visit as some of the money will surely go towards the protection of the site. I’ll leave it open for you to decide. 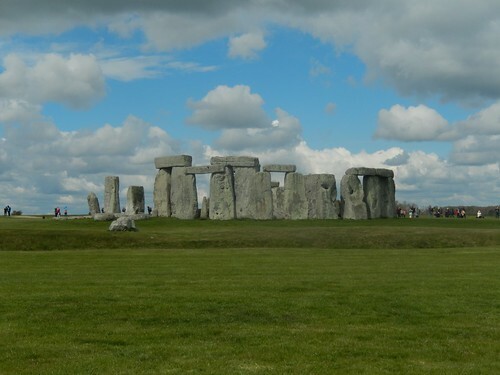 I’m now pondering the question – is it possible too freely visit Stonehenge at night?! Somewhere along the lines, there must be some form of security of restriction of access… Surely? Would you like to see all of my photos? Please click here. 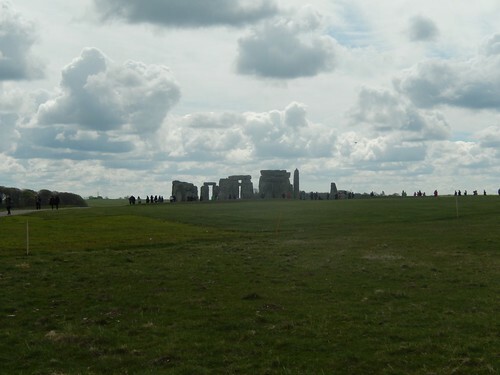 When I visited Stonehenge (many,many years ago) you could wander freely among the stones. Like you, I remember being shocked by the closeness of the road and the roar of traffic seemed to destroy the atmosphere. Although the road was close visually, I don’t remember being able to hear the traffic clearly. It was very slow moving – my assumption was that drivers were slowing to take photos! 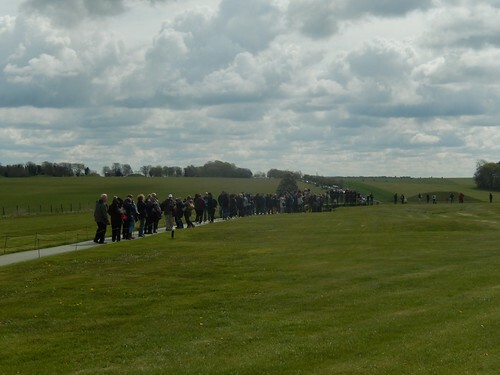 If anything bothered me about the visit, it was the hordes of people and constant need for others to take photos of themselves, obstructing the narrow walkway that surrounds part of the stones. A good few years since I’ve stopped there. 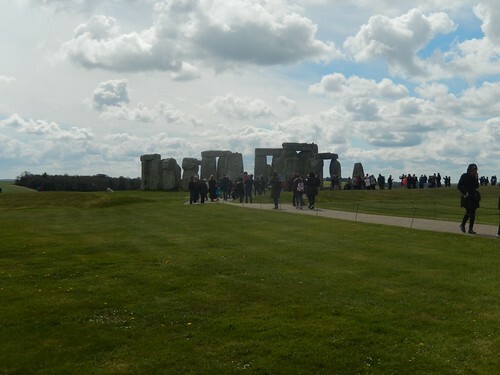 Used to stop when travelling on the A303 to Exeter years ago because as NT members it cost nothing, but that was in the days when the visitor centre and car park was right next to the stones, so you did not have to faff about with buses. Even then though you could not walk up to the stones. Still it looks like there is a bit more of a visitor centre now with a bit more to see (I seem to remember it was basically just a shop, toilet, cafe and admission desk before). The road the buses go on now from the new visitor centre used to be an A-road but was closed a few years ago. I too have wondered if you can get in there at night from that byway but I suspect not. Be interested to hear if you try, though. As to the A303 as you probably know there have been various proposals to move the road or even (the last I heard) put it in a tunnel. I think this is driven by a desire to make Stonehenge more natural and to improve the road and remove a traffic blackspot, as most of the A303 is a dual carriageway but this is one of the stretches that isn’t. 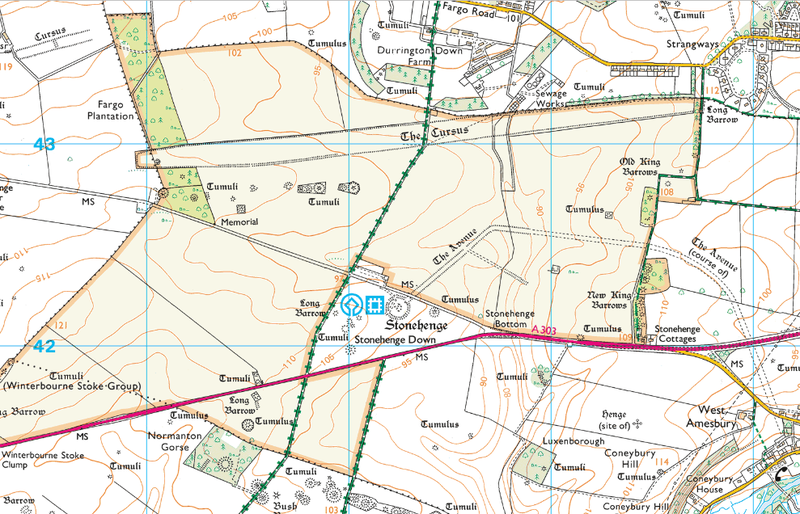 Given how empty the area is around Stonehenge and that most of the land is owned by the MOD why they can’t just move the road south by a mile or so, seems like it would be much cheaper than building a tunnel! 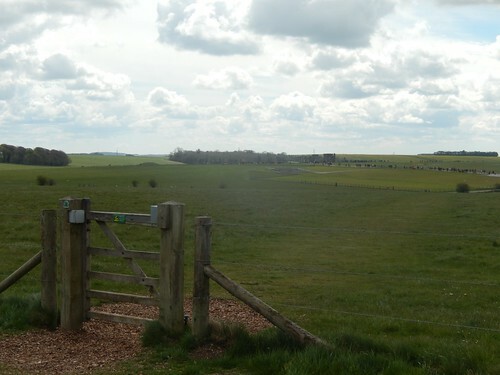 Have you been to Avebury? I prefer it to Stonehenge, because there you can go right up to the stones however it is even less “natural” than Stonehenge becuase there a road goes right through the middle of the stones. However it does also have a pub alongside! 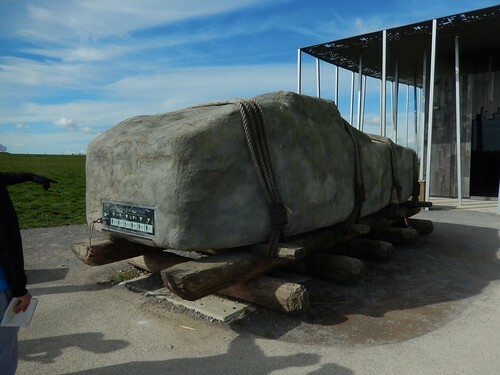 I did like that the visitor centre was so far from the stones as it reduces the environmental impact, slightly. I thought the tunnel idea had been turned down but I read in a National Trust magazine this week that they’re going ahead with it… I quite agree that it does seem a lot simpler to just move the existing road. How much space do those tanks really need? I went to Avebury a couple of years ago and enjoyed it for similar reasons, especially walking down the avenue. Another favourite is Stanton Drew Stone Circle – have you been there? 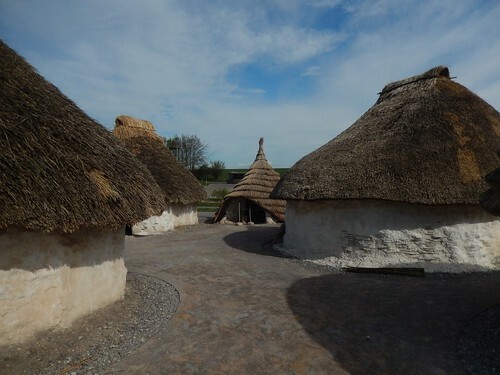 No not been to Stanton Drew but it looks good. Thanks for the tip!